It’s important to note at the outset that I have no love for Jones whatsoever — lest this be read as some kind of endorsement or defense of InfoWars. It is not. When you hound the parents of dead children and promote the theory that inter-dimensional “lizard people” are secretly running the world, you relinquish the right to be taken seriously by a lot of people. But this is not about Alex Jones or what he believes. It is about the fact that the Left has willfully decided that massive corporations, working hand-in-glove with government agencies, as we know they do, should be the arbiters of truth and should hold the power to decide what we see, hear, read and believe. Just a few days before the Jones ban, journalist Matt Taibbi wrote a piece in Rolling Stone about the slippery slope of Facebook censorship. These corporations, he said, have their hands on what is “essentially a direct lever” over nationwide news distribution. “It’s hard to understate the potential mischief that lurks behind this union of Internet platforms and would-be government censors,” he wrote. 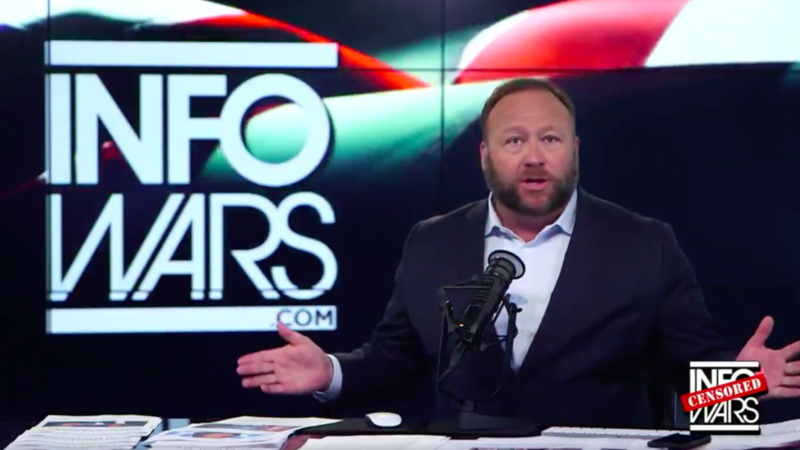 Make no mistake: The US government has the power to exert massive, indirect control over speech and political discourse through social networks — and anyone who argues that Alex Jones is some kind of special case, obviously has not been paying attention. Jones is simply an easy target — a good, high-profile test case, so to speak. But the rush to stamp out or ridicule dissenting voices goes far beyond extremists like Jones. To understand how ingrained the distaste for any kind of dissent has become in American political discourse, consider the fact that, this week, actress Alyssa Milano suggested that people who voted for the Green Party in a special election in Ohio were actually part of a Russian meddling campaign. There was no other legitimate reason to vote Green, she said. Remember, conspiracy theories are just fine if the targets are deemed acceptable by the establishment. This neo-McCarthyism has been steadily creeping back into the mainstream for years, but gathered steam with the election of Donald Trump and the onset of Russiagate, which has gripped American political discourse now for the better part of two years. Once-skeptical “liberals” are suddenly in thrall to the benevolent “intelligence community” and are more than happy to brand as a traitor to America anyone who questions its power and innate goodness. Slowly but surely this kind of toxic and Orwellian political climate numbs people. Suddenly, calling Green voters Russian agents becomes normal. Daring to question the conclusions of the CIA becomes anti-American. Calling for the wholesale banning of figures you don’t like from internet platforms inexplicably becomes a defense of Democracy and free speech — rather than an attack on it. This is the beginning of the normalization of internet censorship. It is no conspiracy theory to say there are plans afoot for further censorship of the platforms from where two-thirds of Americans get their news on a daily basis. After news broke of the Jones ban, Democratic Senator Chris Murphy tweeted that InfoWars was “the tip of a giant iceberg of hate and lies” using sites like Facebook to “tear our nation apart” and called on tech companies to “do more” than take down one website. It was so important, he said, that Democracy’s very “survival” depended on it. That tweet should be terrifying to the left, but somehow, it isn’t. Somehow, we’re at a place where normal, reasonable people arguing against censorship are the ones being branded as fascists and lunatics. Responding to Murphy’s tweet, journalist Abby Martin issued a reminder that a 2017 report released by the Office of the Director of National Intelligence said her show on RT had sowed “radical discontent” for covering issues like fracking, police brutality and social inequality. This gets to the crux of the issue. It’s not a case of ‘if’ the government might start branding perfectly reasonable dissent and debate as radical and dangerous — it has already happened. But it wasn’t just Murphy waxing lyrical on Twitter about saving American democracy. There are reportedly actual plans being circulated in Congress for further censorship and regulation of the internet. A leaked memo drafted by Democratic Senator Mark Warner lists a number of proposals for government intervention online, including forcing platforms to verify identities and locations of accounts, to do more to determine which accounts are “inauthentic” and to “label” bot accounts in some way. Perhaps most hilariously, it also suggests a government-funded initiative for teaching “media literacy” to children from an early age. Those cheering Jones’ collective banning at the hands of all-powerful digital overlords should ask themselves a few questions. Do you really want tech giants, working with governments, to be the ones deciding what constitutes “fake” news? Who gets to decide what a conspiracy theory is? Who gets to decide when something is “real” journalism or when it sows “radical discontent” and “division” and should be banned or labelled as dangerous and divisive hate speech? To suggest that the “slippery slope” argument doesn’t hold water and that Alex Jones is a unique case is to be blind to reality. After the Jones ban, journalist Glenn Greenwald wrote on Twitter that anyone “gullible, obsequious and subservient enough to trust Facebook” to determine what constitutes “hate speech” should travel to the West Bank and Gaza. Last year, after Israel threatened Facebook, representatives from the social media giant met with the Israeli government to decide which Palestinian accounts it should shut down — and since then, as Greenwald reported in the Intercept, Facebook has gone on a “censorship rampage” against Palestinian activists. Twitter has gotten in on the censorship action, too. The platform has recently been taken to task by Vice News for “shadowbanning” conservative lawmakers on Facebook — not deleting their accounts, but making them harder to find and their tweets less prominent in their followers’ timelines. Some on the progressive left have opposed this creeping censorship, cognizant of the fact that it leads to nowhere healthy, but others have cheered along, perhaps under the naive and totally false assumption that only the right-wing will feel the sting. Well, they shouldn’t feel so comfortable. Google has already been accused of censoring left-wing and socialist websites. Sites like Alternet, Democracy Now and Counterpunch all experienced huge drops in traffic since Google changed its algorithms to combat “fake news” online. The most ironic part is that all of this is framed as some kind of noble effort to protect Democracy and truth – and, disturbingly, people are buying into the idea that the government (and the corporations they wield massive control over) are best placed to determine which websites are peddling propaganda, which pundits are manipulating us and what information counts as disinformation. Regardless of anyone’s views on Alex Jones, we should all be concerned about the precedent his banning sets for online censorship. There’s already more than enough evidence to suggest that he wasn’t the first and won’t be the last casualty. This entry was posted in America Nord, Articoli e Testi, English, Europa, Repressione e Controllo, Tecnologia by DOLI CAPAX. Bookmark the permalink.